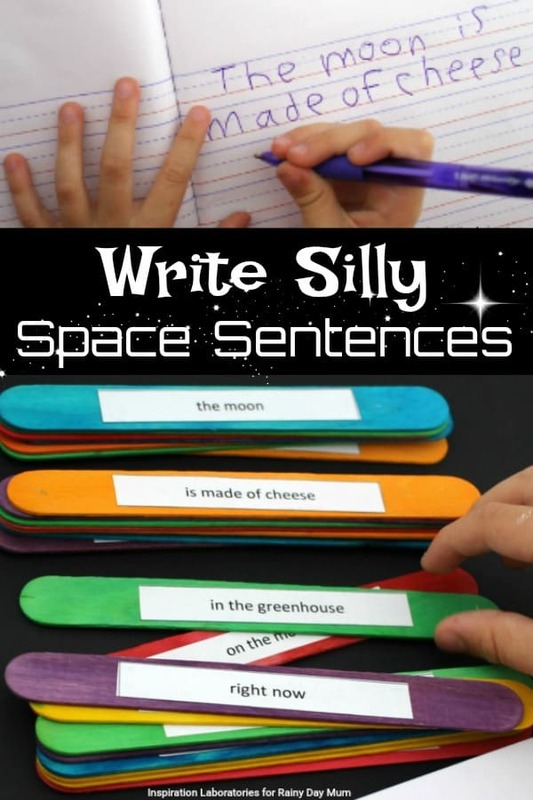 For today’s Storybook Summer post we are writing and making up sentences all about Space – this is a great way to practice handwriting and get creative with kids especially if they are reluctant spellers or writers as you provide the children with inspiration and the sentences that they come up with can be out of this world funny. 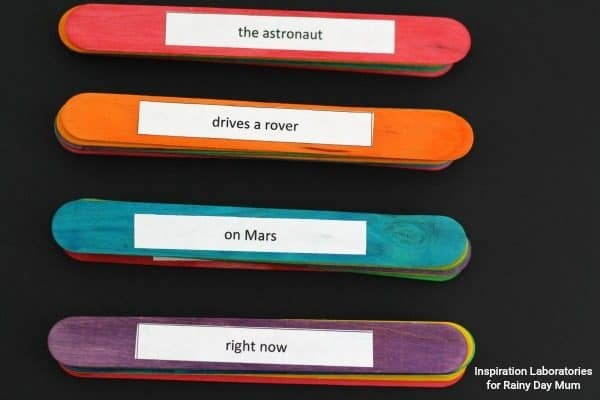 Try this and our Solar System Poetry together especially if your reluctant writer loves anything to do with Space. My son loves anything to do with space. 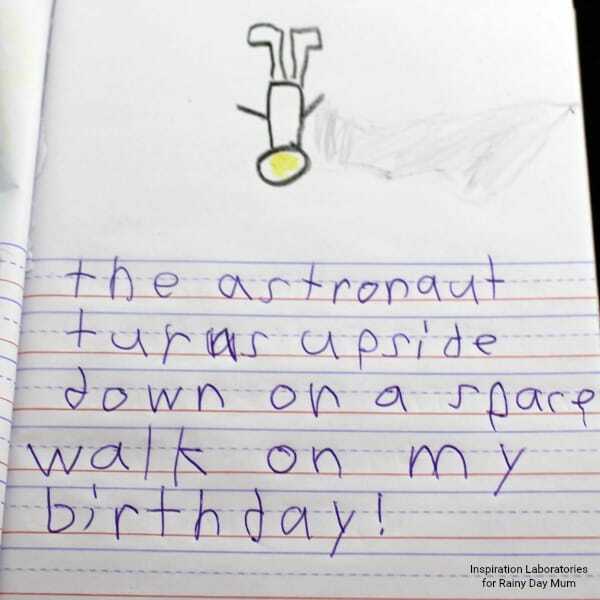 Today I’m using his love for space to encourage reading and writing with silly space sentences. He enjoyed the activity even more than I thought he would. Recommended to be paired with this book which can be purchased from our Affiliate Link Astronaut Handbook by Meghan McCarthy. You can find more book recommendation for the Space theme in our Space Books for Junior Astronauts. The idea for this activity came from a worksheet my son brought home from first grade. The worksheet had a mixed up sentence and a space for drawing a picture. The goal was to unscramble the sentence and then write it in the correct order. I wanted to make more than one sentence. 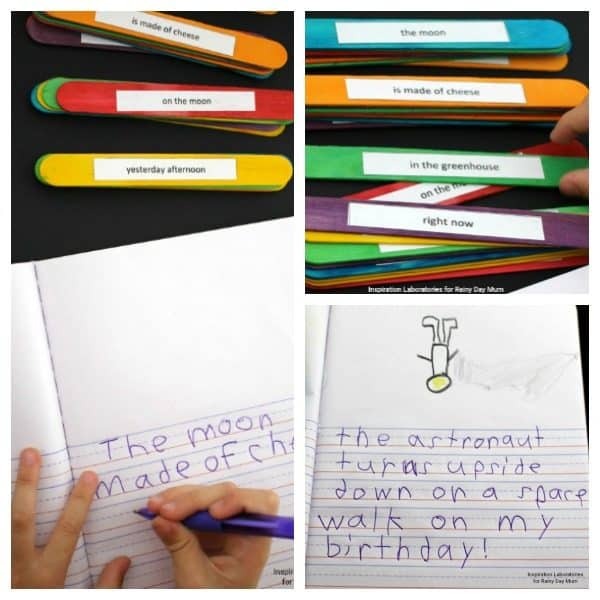 I saw the Roll a Space Sentence from Royal Baloo and the Writing Sentences: A Roll and Write Activity from This Reading Mama. I essentially combined the ideas and added a drawing component. 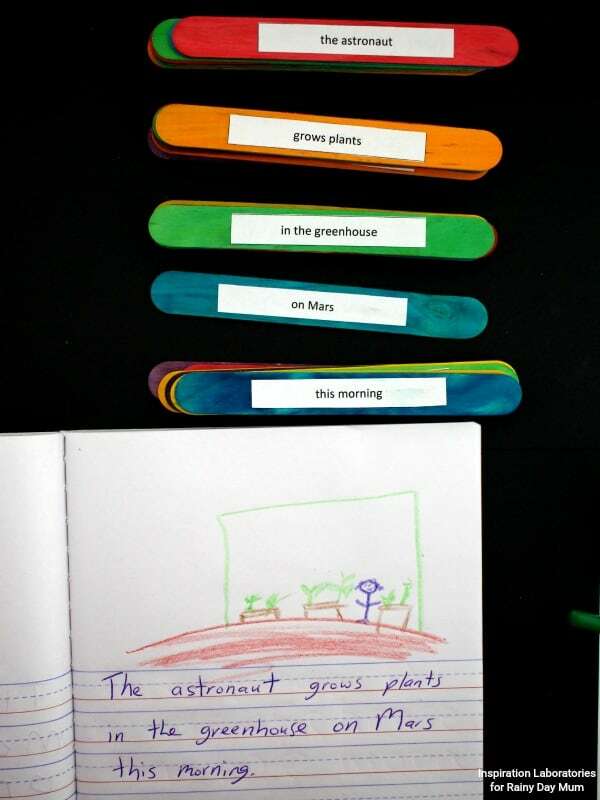 My 7 year old helped me create the words for our space sentences. We organized it into 4 categories – who, does what, where, and when. I cut out the words and glued them onto craft sticks. You can download the space sentence strips here. 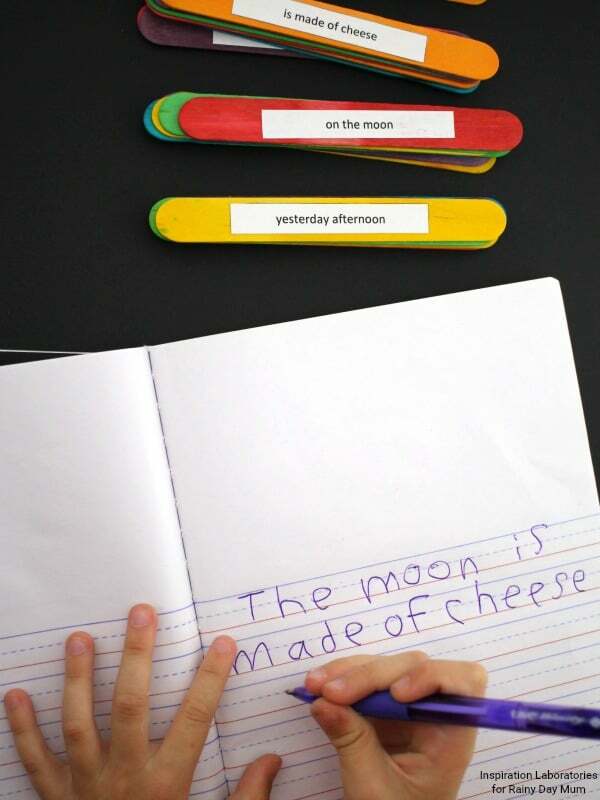 I also created space sentence word cards which you can subscribe to our Hands-on Activities newsletter and download for FREE in case you don’t want to use craft sticks. Just print the cards out and cut them up. To make them more durable, use cardstock and/or laminate them. 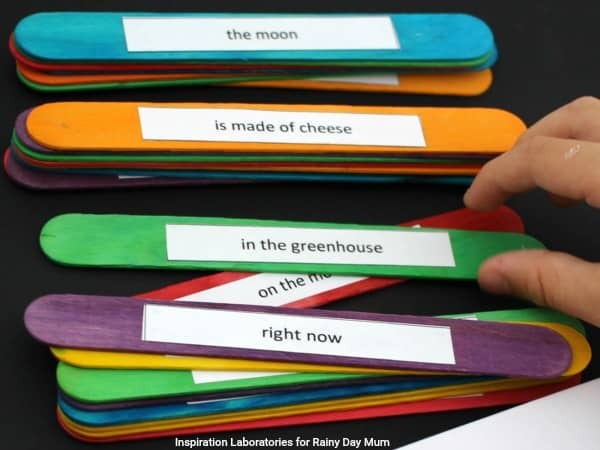 Organize the craft sticks or cards into the four categories – who, does what, where, and when. Choose a craft stick or card from each category. If you randomly choose, your sentences will surely be extra silly. They may not even make sense. We like creating our own silly sentences by choosing one from each category ourselves. My son liked making this silly sentence rhyme. We drew pictures to go along with our sentences. 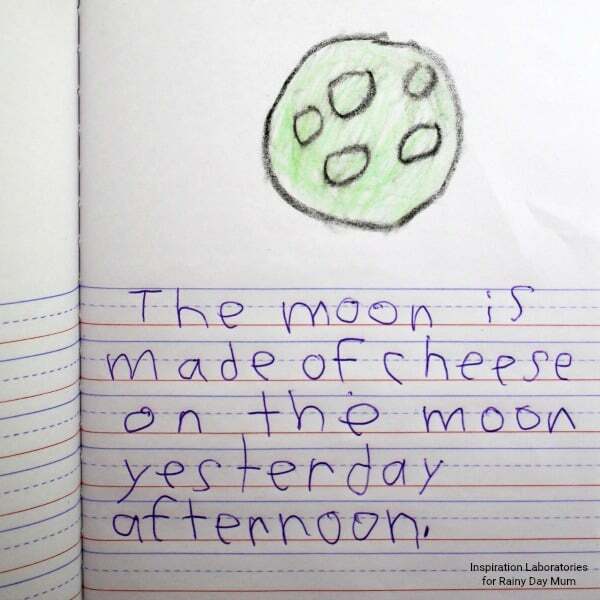 Aiden’s moon cheese is green. We took turns making and writing sentences. My son is more likely to do an activity if I do it with him especially if it involves writing. I added an extra where to this sentence below. I didn’t think “in the greenhouse” quite gave us enough information. I was going to leave off the when, but Aiden insisted I add one. Writing silly space sentences was definitely a hit in our house. We’ll be trying it again soon. These affiliate products are ones that we recommend either that we have used when visiting friends, created or have been lucky enough to own ourselves. 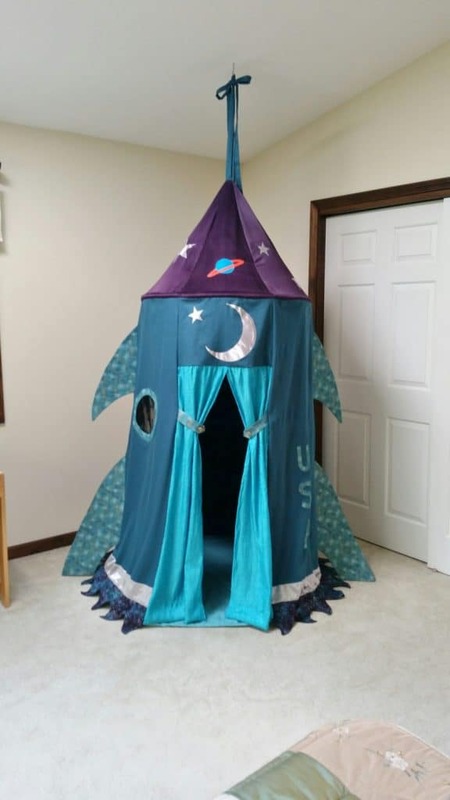 I don’t know about the kids but I would love this Handmade Rocket Tent it would make an ideal play space, or even a reading corner for kids as they get older. Pile it with cushions and they would have a space to sit and read away from everyone else. What better way to encourage your little Space enthusiast than with their own Telescope. Children’s telescopes don’t have to be expensive as on a clear night with a full moon you should be able to get a really good look at the craters as well as focus on some of the easier to see areas of the night sky. It’s not always possible to get out and see the night sky, but you can help your child learn some of the Constellations in the Northern Hemisphere with this Planetarium Projector from the Smithsonian. Astronaut Handbook by Meghan McCarthy is a great read for aspiring astronauts. It’s a non-fiction picture book full of facts about what it takes to be an astronaut. The book is also quite hilarious. There’s a diagram of a space toilet and tales of how you must ride in the “vomit comet” during astronaut training. My son was enthralled throughout the entire book. Learn how to make straw rockets and get our free printable rockets and moon target. Learn about the planets in our solar system through this collection of planet activities. If your kids love space, you’ll want to check out this collection of space toys and gift ideas for kids.